4 bedroom, 3 bathroom villa in the Orange Tree community. Owned by Ray and Babs Borrell. Ref: 3496. 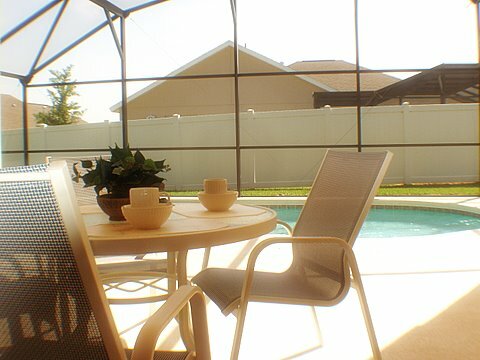 Citrus Retreat (built 2008) is our home in Florida and we would like to share our home with you during your vacation. It is located on the award winning development of Orange Tree (off Hwy 27)where the villas are spaciously sited. The development has its own tiny tots play areas, tennis & basketball courts and a soccer field as well as several orange groves. 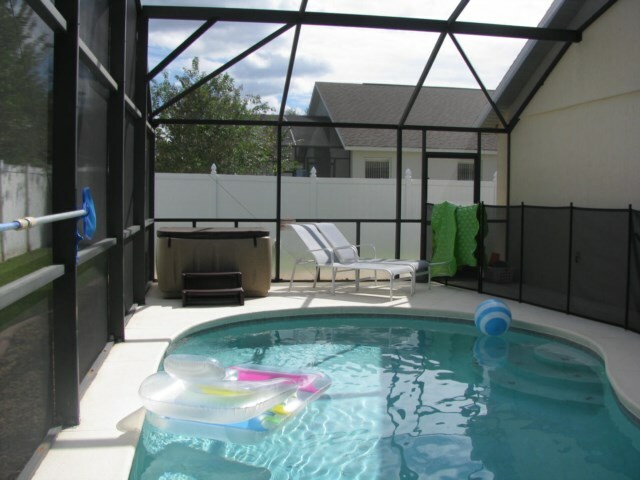 It is situated close enough to the theme parks to allow you to come home during the day and relax in the pool before returning for firework displays or maybe the Kissimmee Old Town car parade. Our villa has 4 bedrooms/3 bathrooms and we feel that we have everything available that you could need for your stay - secluded salt water pool (no sore, itchy eyes! ), hot tub, games room, wireless internet with computer/printer, monitored security alarm & small safe for peace of mind. If you are travelling with small children we have a travel cot, stroller, high chair and baby monitor all ready for you. Although suppermarkets & restaurants are only a few minutes drive away we arrange for a 'Welcome Pack' of groceries to be in place for your arrival so that you can relax after what can be a long, tiring journey. Close by is Lake Louisa State Park where you can spend time walking or fishing away from the hustle & bustle of theme parks and shopping malls. Citrus Retreat is our recently built (2008) home situated on Orange Tree. We welcome you to share our home with you for your holiday. The villa is suitable for all the family including well behaved mother-in-laws! It has 4 bedrooms/3 bathrooms (2 ensuite), a secluded salt water pool (which can be heated), hot tub and games room and sleeps up to 8 in their own beds. For your entertainment besides the games room there is a large TV in the living area and TV's in all the bedrooms with cable providing over 60 channels. A computer with wireless internet access is situated in the kitchen area together with a printer - handy for online check-in. There is also a Play Station 2 with a small selection of games, a CD/radio, a DVD player and a selection of books and games. Local & national phone calls are free and european calls are free for a limited time. Citrus Retreat is fully equipped with everything you will need from travel cot, high chair, stroller and inflatable toys for the pool for our younger visitors to towels and pool towels. The villas is fully air conditioned for your comfort and all bedrooms, the games room, living area and lanai have ceiling fans. Our local property manager checks the property before your arrival and is available 24/7 if you have any problems. A 'welcome pack' will be in place when you arrive in order that you can relax after what can be a long day travelling. The villa is professionally cleaned prior to your arrival and the pool, hot tub and garden are tended weekly. While security in the area has not been a problem the villa has a 24 hour monitored alarm and a small safe in recognition of the fact that you may have with you important documents. The villa has 2 master bedrooms both with ensuite facilities. 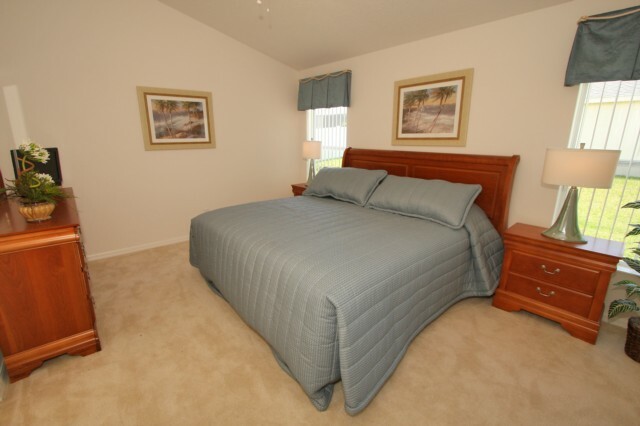 One master room has a king size bed and access direct to the pool area. its large ensuite bathroom has a walk-in shower, large bath, his & hers vanity units and toilet. There is also a walk-in closet with a small safe. The second master bedroom has a queen size bed, built in closets and its own bathroom. The other bedrooms are twin bedrooms with built in closets and a bathroom between the bedrooms. The spacious living area, which has direct access to the pool/lanai area, has plenty of seating for everyone and has a dining area adjoining it with seating for 8 people. The kitchen is light and airy. All essential equipment is supplied and there is seating for 4 people. 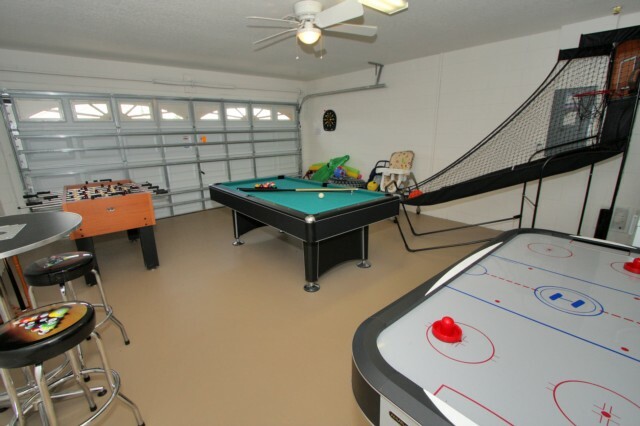 Pool, air hockey, fussball, basketball and electronic darts are available in the games room. Ideal for evenings when the younger children area asleep or whilst waiting for all of your family to be ready for the theme parks. The secluded pool, which can be heated in the cooler months,is a salt water pool therefore no itchy, sore eyes like with a chlorine pool. It has underwater illumination and is surrounded by a removable child safety fence. Situated on the decking is a hot tub, where you can relax after a long day at the parks. 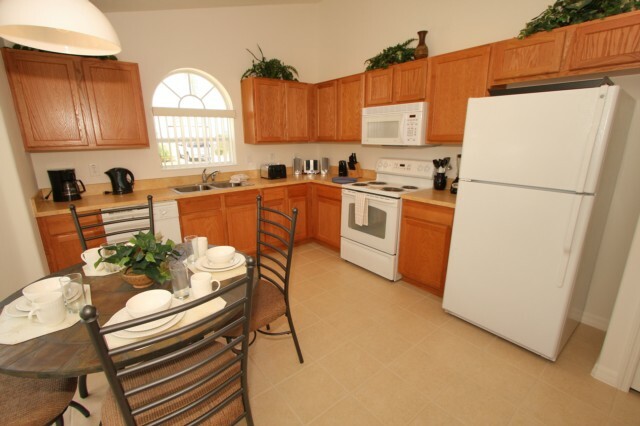 There is a large lanai area where you can sit in the shade and enjoy al fresco meals. There are also some sun loungers for those who like the sun. Pool heat is recommended from October - April . 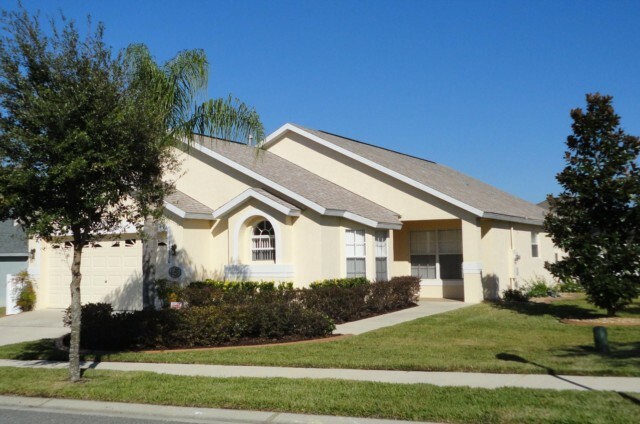 Orange Tree is a small development of quality homes situated close to all major attractions (15 mins from Disney World). Nearby are many restaurants and take-aways together with supermarkets (Super Wal-Mart 5 mins) and pharmacies. A short walk away from the villa is a tiny tots play area. There are also tennis & basket ball courts and a soccer field on this award winning development. Only minutes away is Lake Louisa State Park where you can relax whilst fishing or walking in the countryside. There are many golf courses within a few minutes drive from Citrus Retreat. Average rating: 4.8 / 5 from 13 reviews. Stayed in this lovely villa for 2 weeks. Spotlessly clean and maintained with everything needed for everyday family life was provided. We had great communication from the owners and the neighbours were friendly. The grocery pack was very welcome and saved us a supermarket trip after arriving late. The location is great. Quiet but close to parks, restaurants, Publix, and Walmart. The pool was great with a bonus of a hot tub. We will definitely stay here again and highly recommend. Owner's response: Good to hear that you enjoyed your stay. We look forward to welcoming you again in the future. WE HAD A FANTASTIC STAY AT CITRUS RETREAT. IT IS IDEALLY LOCATED AWAY FROM THE HUSTLE AND BUSTLE BUT NOT TOO FAR FOR THE PARKS. THE AREA AROUND THE VILLA IS PEACEFUL WITH SOME REALLY COOL WILDLIFE AND WALMART IS JUST AROUND THE CORNER. THE VILLA ITSELF IS A LARGE SPACIOUS HOME. THE GAMES ROOM, POOL AND HOT TUB WERE THOROUGHLY ENJOYED. EVERYTHING WE NEEDED FOR COOKING AND DINING WAS AVAILABLE, IT REALLY IS LIKE HOME. WE WOULD LOVE TO RETURN IN THE FUTURE AND HIGHLY RECOMMEND CITRUS RETREAT AS A GREAT BASE FOR A HOLIDAY OF A LIFETIME! We really enjoyed our stay at this beautiful villa. We stayed here for two weeks in April/May & it was perfect. The heated pool & spa made days in the villa go quickly and the computer & Games room is an added bonus that we really enjoyed having. Babs & Ray we’re an absolute pleasure to deal with & the welcome pack was a great feature that was really appreciated, especially after a long flight. Lovely quiet location & around 20 minutes to the closest Disney park. A huge selection of restaurants & shops close by. We would definitely recommend! Owner's response: So glad to hear that you had a good time and enjoyed all the facilities of our home. We hope to welcome you again in the future. This was our third visit to Citrus Retreat, situated in an ideal location for us to enjoy the many golf courses in that area. As keen golfers this is an essential part of planning our trip to Orlando. 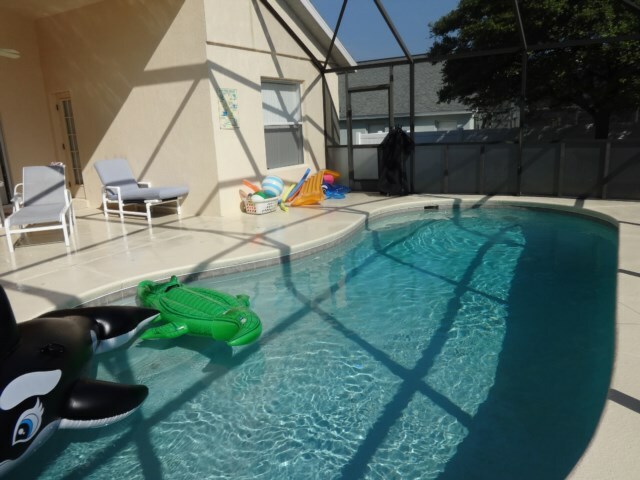 Ray and Babs are very accommodating owners and the villa is well appointed and looked after by the management company, We will certainly keep this villa on our list for any future trips to Orlando. Owner's response: It is always nice to welcome returning guests. We look forward to hearing from you in the future. Our first time at this villa on Orange Tree we have stayed at this location before , very well equipped quiet location excellent neighbours. Excellent salt water pool area complete with hot tub great after visiting the parks. Ray and Babs the owners very professional in the way they run there villa,great welcome pack every thing you need for your arrival. We were there during hurricane Irma, no problem just stocked up with the essentials and stayed in the inner on suite bathroom. Would recommend a stay, very comfortable. Owner's response: Yes we have great neighbours who we understand checked on you during the hurricane. You will certainly have some 'different' memories of your holiday e.g. a detailed view of the ensuite bathroom :) Glad that Irma didn't spoil your visit. We loved this villa very much, great location in a friendly neighbourhood and really easy to get to all the attractions. Great communication with Ray & Babs prior to the holiday, they were always really happy to answer any questions we had and the information they sent prior to the holiday was really informative. The villa could not be faulted, it had everything we needed and more. The pool was great especially after a long day at the parks (as was the hot tub! ), we also loved the games room which provided many games of pool! Thanks for the welcome pack, such a lovely idea. We will definitely be back when we next visit Orlando. Owner's response: Thank you for your kind words. We look forward to welcoming you to our home in the future. Owner's response: So glad to hear that you all enjoyed your stay in our home. We look forward to welcoming you again in the future. visited citrus retreat over Christmas 2016. we have stayed in lots of villas in Orlando over the last 20 years this is definitely one of the best. The property is very well maintain and decor modern. We paid extra for pool heating as it can be cool in December which made the pool feel lovely, we also enjoyed the hot tub which was a special treat at the end of long days out at the attractions. lovely touches over and above a massive Christmas tree in the villa during our stay along with a welcome pack full of essentials upon arrival. We will definitely use this property for our next Orlando visit. Nice location and easy to navigate to all parks/shopping. A superb holiday home, all the usual home comforts, and a very nice touch of a welcome food parcel.The games room was a nice bonus, as was the hot tub, and the excellent pool.The location is ideal, as central to virtually everything, yet a nice quiet retreat to relax in.All in all, this is a super home, and I would recommend to friends , family, and anyone interested in staying in Orlando( another plus was there is an ALDI shop 5 minutes away, if you,re on a budget,lol).We would use again!!!!! Owner's response: Glad you enjoyed your stay in our home. We look forward to welcoming you back on any future visit to the area. Owner's response: Glad to hear that you had a lovely stay and that you appreciated the welcome pack. We feel that it helps when you have had a long day traveling to be able to have a snack without having to go to the supermarket. This is a great place to stay. Got everything you need at good value. Very homely. Near to parks, shops and restaurants. Owners are very friendly and helpful also. Owner's response: Thank you for your kind words. We hope to be able to welcome to our home again in the future. Your enquiry will be sent to villa ref 3496 only. This page has been viewed 8384 times since 02 Jun 2011.